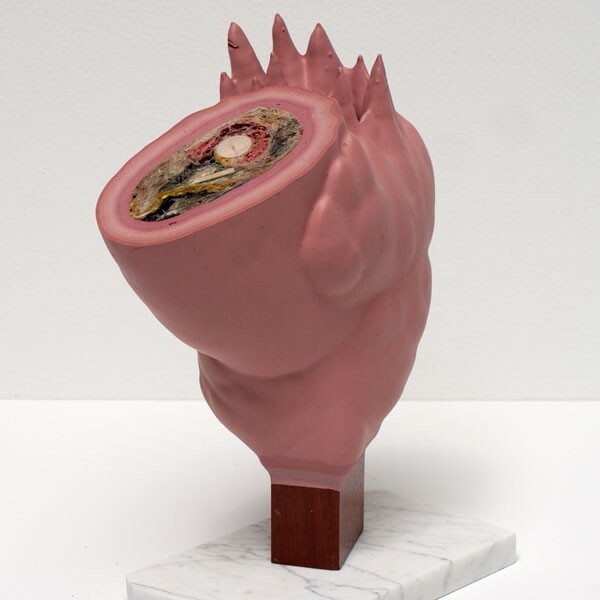 Pink Marble Cut, by Brandon Anschultz, from "The Tyranny of Good Taste"
Stimulate your retinas with something visually appealing this weekend. Here's what's going down in visual arts. "The Tyranny of Good Taste" at Columbia College Glass Curtain Gallery Work from 15 artists from around the country that explores the theme of making art during hard economic times. On display weekdays through 1/25. Read Sarah Nardi's review here. "Mike's Kind of Town" at Cobalt Studio The kickoff of an exhibit featuring street photography by Mike Pocius. Opening reception 6-10:30 PM. "In the Hood: Portraits of African American Professionals" at Zhou B Art Center The final day to view paintings by Cesar Conde. "It's the Political Economy, Stupid" at Gallery 400 The last day to see works exploring the financial crisis of 2008. Read Aimee Levitt's write-up here. "ART/TECH: Interface" at Arc Gallery The last day to view work from a variety of artists that examines the impact of advancements in technology on their lives and experiences. Juried by Jan Tichy. "Suicide Narcissus" at Renaissance Society Your final chance to view a group show featuring multidisciplinary work, including sculptures, site-specific installations, and video.